I love to eat. I eat constantly, and with everything I consume, it's a miracle that I'm not as big as a house, especially since I've been pretty much sedentary for the past four weeks waiting for my shin splints to heal and my orthotics to arrive so I can start running again. I don't eat out of nervousness or boredom - I just like food. And I'm eating pretty much throughout the day. Most of my colleagues will agree that they invariably see me munching on something, and those who have seen the inner sanctum of my desk would know that the contents of my bottom left drawer would feed a small country. 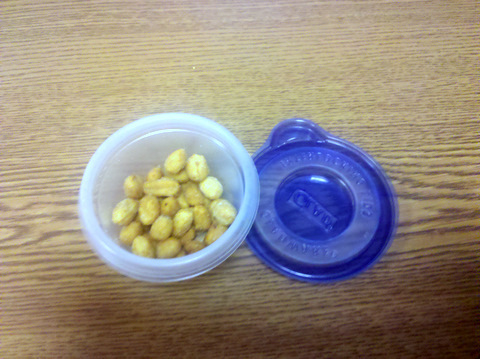 So now that you've picked yourself up off the floor from laughing hysterically at the amount of food in my old-lady-like collection of plastic tubs (one of the reasons why I will probably never own a briefcase - because my lunch won't fit in it), let me add that this doesn't even include my sandwich fixin's which were already in the fridge by the time I decided to amuse you with this photo - ha! And while this seems like an extraordinary amount of food for one guy to consume in a day (and trust me, sometimes I finish all this and I'm still hungry by the afternoon), when it comes down to it, most of it's pretty good for me. I suppose. So let's break it down by the hour. 9:00 a.m. I don't eat breakfast at home, because I'm usually just rolling out of bed into my pre-selected clothes from the night before, slopping some product in my hair, brushing my teeth so I don't terrify my fellow commuters with morning breath that would slay dragons, and racing to the bus. 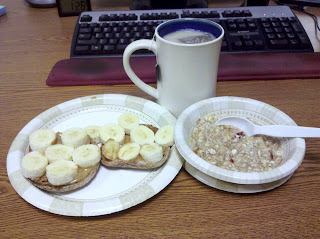 So at the office, I get to assemble and chow down on my breakfast, which - on the particular day in question - involved a whole wheat English muffin with peanut butter and banana slices (I know - so very six-year-old of me, but it's frakkin' awesome); a bowl of Quaker instant apple-cranberry hot cereal (just add water and voila! - a hot breakfast, which is great in the winter), and my morning cup of Earl Grey tea, sweetened with a bit of honey (which I also keep in my drawer stash). 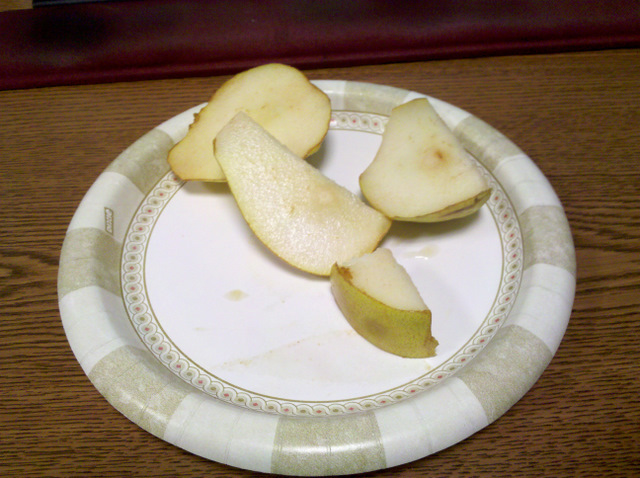 10:00 a.m. Having had a breakfast that would keep most people going until lunch, an hour later I'm ready for the second course, in this case, a Bartlett pear. I'm not a huge fan of pears, in general, but this one was pretty good, as you can tell by the piece I had half eaten before I snapped this shot. And hey, I know I could have gussied up the presentation on my oh-so-fabulous paper plate, but I'm a fundraiser, not a food stylist. We each have our strengths. 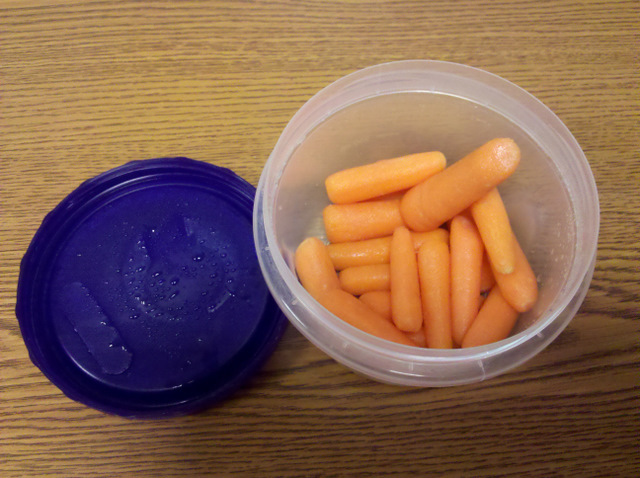 11:00 a.m. A handful of baby carrots. Wish I could drench them in a sour cream dip of some sort, but I suppose that would be bad for me. And I usually try to keep us stocked with hummus (which I know is the easiest thing to make, but I usually just buy it in the store) as a healthier option, but it wasn't on sale last week, so I was SOL. Or rather, SOH. And so I crunched on my sad, plain carrots. Sigh. But they filled the munchie gap. For that hour. 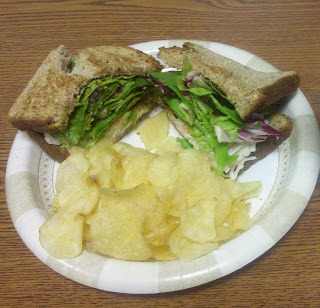 12:00 p.m. Oh thank God, it's lunch time. Without a toaster at the office, it's unlikely I would even be eating a sandwich on cold, lifeless bread. 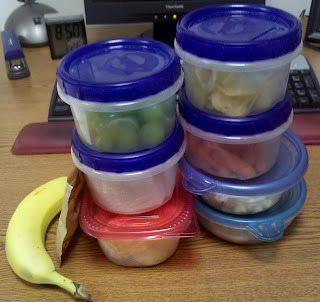 Instead, I bring all the sandwich elements (in separate tubs - of course), and put it all together at lunchtime. And in this instance, it was seafood "salad" (faux crab meat and little shrimp) from Jewel, with baby greens. And if I have a vice, it's potato chips. Sweets? Meh - I could live without them. But chips - mmmm... And don't waste my time with regular chips - this particular lunch included a batch of Cape Cod salt-and-vinegar chips. If I could, I would eat salt and vinegar chips every day of the year for the rest of my life. Especially the kind that are so vinegar-y that my tongue curls up and feels funny after a while. 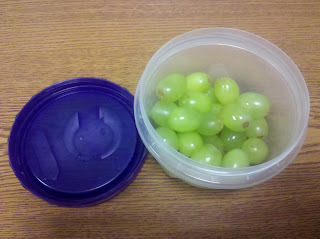 1:00 p.m. Ah, seedless green grapes, another food I would eat every day if I could. Especially during the summer, I live on grapes for snacks. Whenever they're on sale, I usually pick up between six to eight pounds of grapes, and that usually lasts about a week, at most. 2:00 p.m. 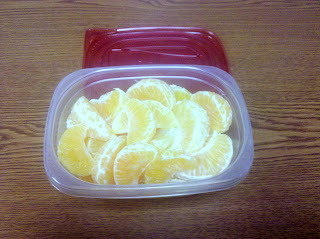 There are many reasons that I love winter - snow included - but it usually means that citrus season is in full swing. And on this particular day, I downed one-and-a-half navel oranges, and two clementines. 3:00 p.m. The only thing wrong with these rice crackers from Trader Joe's is that they're packaged under the description of "Oriental," a word that always gets my goat, no matter if it's being used to describe people (WRONG) or food stuff. Even rugs. 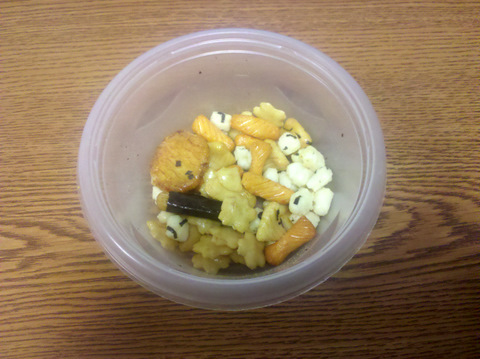 Just call them Japanese rice crackers, which they are, because I ain't seen no Chinese people eat these things (other than me). These come in a large bag for only two bucks, which is awesome, and the little white ones have a bit of a wasabi kick. I particularly love the ones rolled in nori (dried seaweed). So that's pretty much the daily intake for me. In reality, a good portion of it is fruits and vegetables, so even though it seems like a ton of food, it's fairly healthy. But it takes time to assemble all of this - at least 30 minutes the night before to pre-wash all the fruit, peel the oranges, and find space in the usually-stuffed fridge to store it overnight. But it saves time in the morning because I can just grab it and go. And that, gentle readers, is a brief window into my daily love affair with food. I could probably cut back some, but I have a reputation to uphold with my collection of old-lady plastic tubs and the constant munching. And, if you're ever stranded downtown, and all the restaurants are closed, and you can't find anything to eat....well, don't come a-knockin' at my office, because I've probably eaten everything already. Sorry. Um- WOW! And then presumably you have dinner when you get home? You eat more home prepared food in one day than I do in two weeks. That's impressive, and seems to me, pretty healthy! Hilarious. Thanks for sharing, made my night. Christopher, I loved loved loved this posting. But my dear, I think that your fast food oatmeal is more shameful than the hummus. Nearly every morning I make regular oatmeal in the microwave (it probably takes 30 seconds longer than those packets). Add honey, dried cranberries and sliced almonds. Delicious and simple without the added packaging and way less processed! Holy Smokes! That's a serious amount of food! And tupperware. Wow. But you do a great job of keeping it healthy.